Rossica has been in existence for more than 90 years. The Society was established on April 14, 1929 in Igalo, Yugoslavia. The brainchild of Eugene Arkhangelsky, a prominent aerophilatelist and philatelic author, its early adherents were mostly émigré White Russians who fled their country after the October 1917 coup and scattered to the four corners of the globe. The political, economic and military upheavals in the 1930s and 1940s chased Rossica's center of gravity from Yugoslavia to the Baltic States and then to Shanghai, where the war in the Pacific prevented it from distributing its journal, and World War II wiped out much of its membership. The Society collapsed in early 1942 and took a decade to reconstitute itself, this time in the United States, where it remains based to this day. 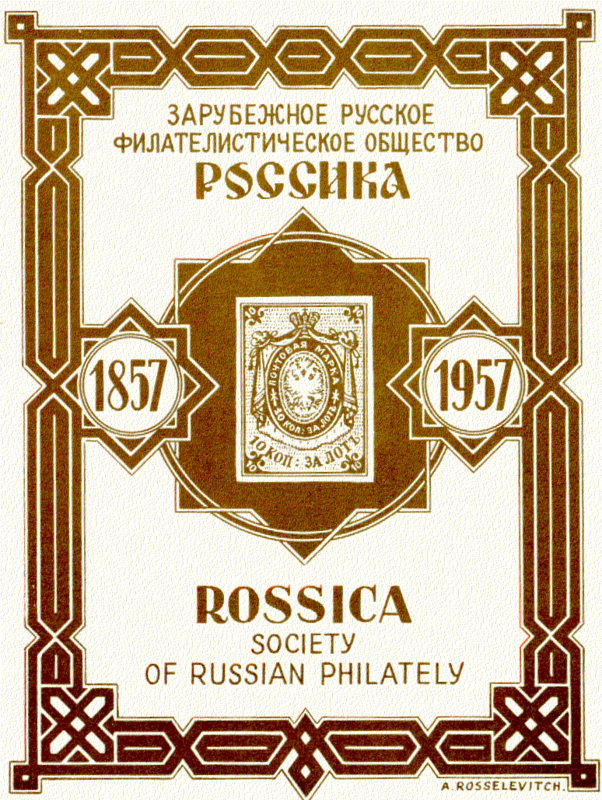 The Society didn't begin as the "Rossica Society of Russian Philately;" rather, it was called "Rossika - The Russian Society of Philatelists in Yugoslavia (ROFRYu)." David Skipton captured the beginnings of the Society in his seminal work "A Short History of the Rossica Society (1929 - 1968)". In 1930, the first journal appeared which would later evolve into today's Rossica Journal of Russian Philately. The first issues of the journal were printed in Russian. In the 1950's the journal was published in both English and Russian. Today, the journal is published exclusively in English, reflecting a need for a common language among our international membership. The Rossica Journal is the recipient of several awards to include the Gold Medal awarded at SESCAL 2003 for Journals 137-138, the Gold Medal awarded at NAPEX for Journals 142-143, and 162-163, a Gold Medal at Chicagopex for Journals 163-164, a Reserve Grand Gold and Gold Medal in the Journals and Periodicals category at Stamp Show 2016 for Journals 165-166. Rossica was also recognized for excellence for Journals 161-162 with a Large Silver medal at LITFILA in Perm, Russia, and the Journal received 5th and 6th place respectively for Journals 165 and 166 in the Gartner International Philatelic Promotion competition. The Society journal earned a Vermiel Medal at the International Philatelic show St. Petersburg 2007. Rossica members throughout the world have won individual medals in most prominent stamp shows throughout the world, and are often times called upon for expert opinions in the world of Russian Philately. Prospective new members can learn about all of the benefits associated with Membership and can download an application form from our Membership page. The Rossica Society is a non-profit 501(c)(3) organization. Today, there are over 303 active Rossica members from 45 US states and 39 different countries. Two Journals published per year. Two Bulletins with Society news published per year. Use of the Rossica library by mail. Significant discounts on Society Publications. Full access to the Rossica Web Site to include research tools, a Society Forum, the Rossica Library listing and more.